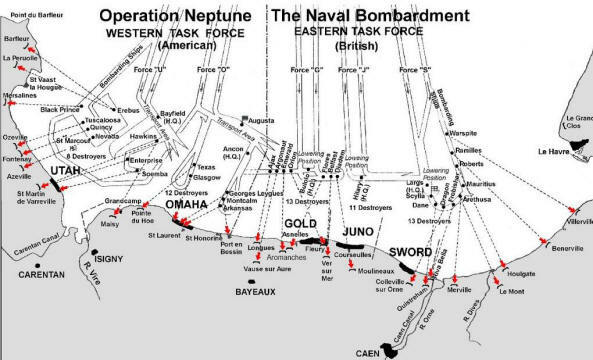 The seaborne assault and landing phases of the Allied invasion of Normandy in 1944 was perhaps the largest, most intricate and meticulously planned naval endeavour in WWII. Paramount to its success was the absolute necessity for a vast amount of requisite detailed work in its conception, planning and execution to maximise success and minimise intent to the enemy. Nothing could be overlooked in the planning of this ambitious operation if the landing forces were to gain a successful bridgehead and lodgement, with the necessary elements of surprise and speed, upon the five designated beach areas and beyond. It seems incredible today to realise that approximately seven thousand individual vessels were to be involved in the subsequent period to the end of July 1944, including warships, troop landing craft, transport, supply and support ships. To the minesweepers and their attendant consorts was to fall the responsibility of leading the assault forces to the Normandy beaches. Contingent upon their effectiveness and timely efficiency in clearing the German mine barrier protecting the area, there lay the potential to cross that finely dividing line between success, or otherwise, for the opening day of this amphibious opposed invasion to establish the second front. The interested researcher can find much of relevance regarding Operation Neptune in official Admiralty archives, naval and war museums and indeed one’s local public library. Conspicuous by their absence are accounts of minesweeping operations and movement logs of individual minesweepers or their flotillas. Yet the minesweeping workloads during the months of June and July 1944 were absolutely vital to the success of the beach landings in terms of men and materiel. That relatively few warships, transport or landing craft were seriously damaged or lost due to conventional mines is fitting testament to the organisation and work of the plucky crews of these valiant, but unheralded little ships, who assured that approach routes, bombarding ship and landing craft anchorages were as free as possible of mines. By well into 1944 minefields were known to have been laid in depth south of latitude 50 degrees N to within ten miles of the French coastline; these fields stretched from offshore Boulogne to the Seine Bay (see map (i)). South of the mined area existed a clear channel used by the Kriegsmarine. The Allied naval planners intended to utilise this channel as the lowering positions for the landing ships to bring in the infantry troops. Ground mines were assumed to be laid between this channel and the beach areas – and these would need to be swiftly cleared just prior to the landings, and opportunity denied to the enemy to lay further mines. The sea mining of the waters chosen for Operation Neptune was potentially both a lethal and most disruptive weapon available for the German forces. 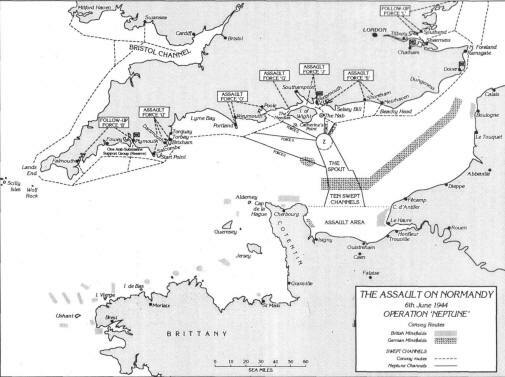 The Neptune routing plan devised involved directing amphibious forces from a large number of ports in southern Britain into Area ‘Z’ (see map (ii)) before turning southwards through the ‘Spout’ and into what would be initially ten channels leading to the lowering positions in the beach assault areas. (i) In respect of each of the five beach Assault Forces (designated U, O, G, J and S), two channels would be cleared S.SE. through the mine barrier for the first wave of amphibious infantry on what would be termed D-Day. One assault channel would be for 12 knot convoys and one for slower 5 knot convoys. These channels were to be numbered 1-10 from west to east. A Fleet Minesweeping Flotilla (MSF) of nine ships would be allocated to each channel to sweep well ahead of the invasion vessels. It was of paramount importance to conceal from the enemy the time and place, and indeed intent, of the landings by the forces following up behind. (ii) Inshore of the coastal channel a Minesweeping Flotilla would precede the movement of the Bombarding Forces of warships to clear the presence of any mines right up to the anchorages of these ships. (the final D-Day positions of the bombarding ships in relation to the five paired channels and the beach areas is shown in map (iii) courtesy of combined ops website). These Bombarding Forces (designated A, C, K, E and D) would target enemy fortifications, gun battery emplacements and reinforcing armour that might be brought up from their reserve points to pose an immediate threat to the LSI(L) craft disgorging infantry onto the five beach areas. There were ground mines, acoustic and magnetic, thought to populate the inshore areas, and the pathway of the bombarding ships had to be commenced as soon as the channels were initially cleared. (iii) When the above two tasks were accomplished, planned to be by 0500, the next phase would be to widen the mine-freed approach channels to form a broad area ( known as the ‘SPOUT’) to allow passage of supply and equipment vessels carrying armoured fighting vehicles. (iv) Constant re-clearing activities were to be maintained in order to nullify mines dropped by parachute from enemy planes or laid from E-boats. To counteract Allied success the enemy did, to some limited extent only, engage on this re-laying with all types of mine including the relatively new oyster mine – these latter were designed to actuate by changes in water pressure as a ship passed in its immediate vicinity. Allied vessels were obliged to slow their speed to a point where pressure generated would be too low to trigger actuation. Thus one can begin to appreciate the inherent potential danger facing the minesweepers and their crews if the enemy, realising the intent and efficacy of the mine clearing operation, responded with air and fast E-boat attack in the early dawn light. Kriegsmarine Group West actually failed (much to the frustration of Vice Admiral F. Ruge, Rommel’s Naval Advisor) to reinforce the mine barrier with new mines and to lay ground mines with delay action fuses off the beaches. This would have made the task of the minesweeping flotillas much more difficult given the time constraints of the overall operational requirements. They were required to keep station and make difficult turns in changing tides as an operational flotilla in the dark and with rough sea. There is no doubt that the minesweeping flotillas would have to take great risks as an acceptable hazard – if engaged they were required to keep to their sweeping courses as allocated. 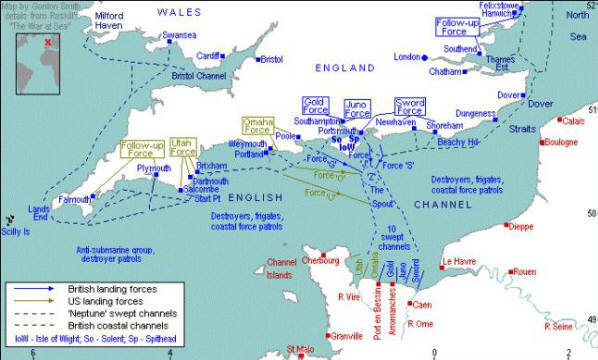 Incredibly, several of MSFs encountered no enemy reaction as they reached the southern end of their respective channels, allowing them to turn parallel to the beaches sweeping for some distance, before heading northwards to sweep ahead of the Bombarding Forces or to widen the channels. In total, about 350 vessels of many types took part in the mine clearing operation of June 5-6. 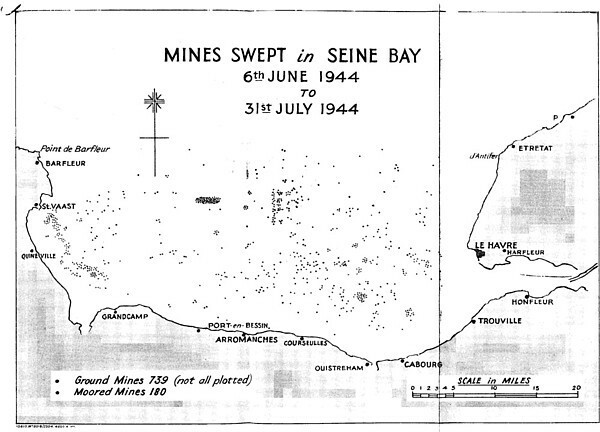 Within each Channel-tasked MSF the typically eight Fleet Minesweepers used (a further was held as reserve for each channel) carried not only gear in abundance to deal with the various types of mines they might encounter but also equipment to deal with the anti-sweeping devices built into the mines. The Fleet Minesweepers were augmented by usually four Danlayers and a small number of Harbour Defence Motor Launches. The latter vessels shallow swept ahead of the Fleet Minesweepers in a protective role. There were other classes of minesweepers as outlined in the table below, and the final type of vessels were the Oropesa “twin Longitudinal line” (or LL) Trawlers of the RN Groups 131, 139, 159 and 181. Two were allocated for each channel flotilla, their equipment being specialised for the sweeping of magnetic mines. Followed the 15th MSF down Channel 10, then proceeded to within 2 miles of beach area, then met and swept ahead of Bombarding Force D which was protecting theForce S assault craft. The British YMS, YMS (US) and British Motor Minesweepers below were given the role to sweep the inshore areas, especially the boat lanes between the transport areas and the beaches, and subsequently the artificial Mulberry harbours after the assault phase. They were equipped with light sweeping gear especially designed for sweeping magnetic and acoustic influence mines in shallow waters. A small number of LCTs were also similarly equipped. By 0330 the ten channels had been swept by the Fleet Minesweeping Flotillas and shortly after the inshore areas parallel to the landing beaches had been swept by the BYMS, YMS and MMS ships. The Assault Flotillas were well into their passage to the Gold, Juno, Sword, Utah and Omaha Beaches to arrive by H-hour, and the bombarding squadrons of battleships, cruisers, monitors and destroyers were now ready to let loose the most concentrated firepower of naval ordnance ever experienced in the history of sea warfare against a land-based foe. The minesweeping flotillas, having been given the honour of leading the way for the Allied Assault Forces, now moved northwards, either widening the channels or withdrawing to holding areas in what was to become, over the next few days, the ‘Trout Line’. This was a defence barrier set up around the Normandy anchorage to protect the ships from the multiple threats of E-boats, R-boats, human 'Neger' torpedoes and Linsen explosive motor boats. The ‘Trout Line’ itself was composed of LC(Guns), LC(Flak) and LC(Supply) set up in a continuous double line one cable apart. The minesweepers slotted in at 5-cables (half mile) intervals six miles seaward on each side and parallel to the beaches. Sword Beach, on the eastern flank, was particular vulnerable to attack from the Le Havre area and enemy submarines were always a potential risk apart from the offensive threats above". Coastal Forces Control Frigates patrolled just outside the line sometimes augmented by destroyers thereby adding to defence in depth. Ships' speeds had to be tempered, knowing the potential to actuate the newish oyster mines. Those 350 or so ships, from the Flotilla leaders to the Fairmile B MLs, had engaged in the most meticulously planned and well executed minesweeping operation ever undertaken and all had survived by the end of D-Day on June 6. This narrative will close with a fitting tribute paid to all those involved, by the Naval Commander of the Western Task Force, Rear Admiral Alan Kirk USN. (ADM 234/366 p. 49). "It can be said without fear of contradiction that minesweeping was the keystone in the arch of this operation. All of the waters were suitable for mining, and plans of unprecedented complexity were required. The performance of the minesweepers can only be described as magnificent." These are the type of men the Vernon Monument will be celebrating and one of the reasons I am so passionate to see it erected. To read about the activities of members of the Landing Craft Obstruction Clearance Units (LCOCUs), the first men ashore on D-Day, see Operation Neptune: Frogmen - The First Men Ashore on D-Day by Rob Hoole in the website's Dit Box. Department of the Navy – Naval Historical Center: The Invasion of Normandy: Operation NEPTUNE; Commander, U.S. Naval Forces in Europe: Volume V (London 1946), United States Naval Administration in World War II. Barnet Corelli: “Engage the Enemy More Closely” The Royal Navy in the Second World War; Hodder & Stoughton, 1992. Schofield B.B. Vice Admiral: “Operation Neptune”; Ian Allen, 1974. The Naval Review: Vol. 32: Issue 4, 1944. The Naval Review: Vol. 34: Issue 2, 1946. Williams Jack: “They led the Way” The Fleet Minesweepers at Normandy June 1944”; publ. J.F. Williams, (Blackpool), 1994.